Contents: Southern's ACF lightweight coaches and dome 1613 (to ONS&L) Tennessean coach 'Bristol' NS-31 aka Southern Research Car R-1 (to be retired) Trials and tribulations of Southern's all-door cars - the production model Southwestern Railway the one in Kentucky (or, whatever happened to the Burgin Branch?) Clayton Harmon remembers his father's career on the Murphy Branch. Contents: All-Ps4 issue (almost). 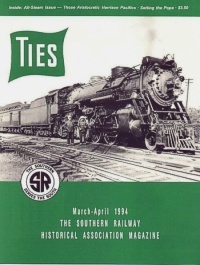 The Harrison Engines - the Ps4 Pacifics, class of 1926, delivered with twelve-wheel tenders and wearing Virginia Green Where they were maintained, how their appearance evolved over the years Bill Purdie describes safety valve calibration. 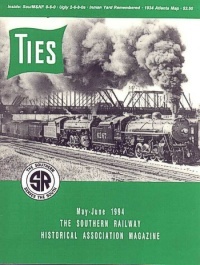 Contents: Review of "Gandy Dancers" video by Prof. Barry Domfeld 'The Last Southern 0-6-0' Morehead & North Fork #12 survives 'Those Woebegone Mini-Mallets' - tales of Southern's 2-6-8-0's on the Appalachia Division Fold-out map of Atlanta's railroads circa 1934 'Coal Goes to War', on painting Interstate hoppers with WWII message Inman Yard retrospective. Contents: All-Meridian issue (nearly). 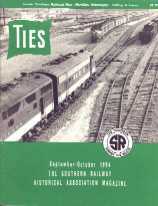 Book review of Southern Railroad Man: Conductor N. J. 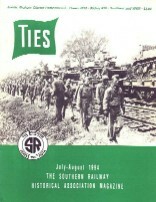 Bell's Recollections of the Civil War Era 'Meridian - The Once and Future Crossroads', by J. Parker Lamb traces the history of railroading in Meridian, MS A compilation of Meridian's rail passenger service, 1870-1994 Carl Ardrey's report of flooding on the Georgia Division Graham Claytor remembrance by Robin Shavers. 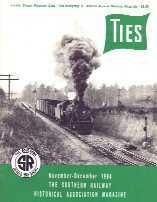 Contents: Obituary for the Norfolk Southern steam program, with several photos of our favorite engines 'The Everyday K' by Dale Roberts and Ed King. Part 1, traces beginning of Southern's K-class 2-8-0's, and the conversion of most of them from slide valves to piston valves after superheating Articles on how steam locomotive power is measured and on the difference between slide and piston valves Atlanta Annual meeting wrap-up with plenty of photos.